Pakalert Press » Is Martial Law Justified If ISIS Attacks? A group of foreign militants infiltrates the U.S. using student visas, weak borders, bribery and cooperation with drug cartels. Secret cells integrate within metropolitan areas and blend with the populace. At the precise moment, they activate, unleashing small attacks across the country in coordinated blitzkrieg-style terror campaigns against everything from suburban neighborhoods to public schools to shopping malls, striking fear into the citizenry, which now believes no one is safe, even in the heartland. With normal law enforcement overwhelmed, the economy on the brink and the populace ready to riot, the military is deployed domestically; curfews, price controls and rationing are initiated; and special operations agents act as infiltrators in order to subdue the terrorist factions. The loss of common liberties is welcomed by most as safety and security become the paramount motivator. A glimpse into the future? Well, perhaps. Actually, it’s the plot narrative to a Chuck Norris movie called “Invasion U.S.A.” The terrorists in that movie were communists from places like Cuba and Venezuela (hey, it was the 80s, and we had no idea that the communists were elitists that had already taken over from within), but the premise is strangely not far from what the government is trying to sell to us as a potential real-life scenario today. As Americans, we have been bombarded with propaganda for decades, which conjures rationalizations for domestic military operations. This propaganda always presents us with an all-or-nothing option: relinquish liberty and beat the enemy, or “cling” to the “outdated” Constitution and fall as a society. There never seems to be a third option, an option that does not require the loss of freedoms and allows for security. In the film “Invasion U.S.A.,” I suppose we had Chuck Norris as a third option, which is not a bad third option in the world of cinema; but I’m sorry to say that Chuck alone cannot save us from what is coming in the real America. I am highly suspicious of the rhetoric coming out of Washington lately in terms of the ISIS situation. ISIS has apparently secured the Iraqi city of Ramadi and put the government there on the defensive, meaning that despite the recent claims that ISIS leadership has been hit in Syria, the group continues to advance. Rumors of potential ISIS attacks on U.S. soil continue to spread from sources like the FBI and the Transportation Security Administration. “Former” CIA officials (is there such a thing?) are also getting in on the action, warning in mainstream media outlets that ISIS has the ability to direct at least small-scale attacks on the U.S. today. However, the threat of ISIS does not frighten me. It concerns me, but what truly disturbs me is the likely government response if such predictions by alphabet agencies come to pass. In my recent article “When The Elites Wage War On America, This Is How They Will Do It,” I examined the tactics behind not only globalization, but also the most probable methods that will be used to secure globalization through the oppression of dissenting voices and groups. Part of that examination included my take on the Jade Helm 15 exercises running from summer into autumn and how they fit directly into the strategies for disrupting insurgencies (revolutions) discussed openly by internationalists in their own symposiums. My conclusion given the clear evidence at hand? Jade Helm is definitely NOT meant to prepare troops for foreign operations. The program is admitted to be a primer for military response to “crisis scenarios,” denoting domestic operation. Special forces groups are training with domestic agencies like the FBI and the Drug Enforcement Administration. And they are training and infiltrating completely American environments, which they would not be doing unless they planned to operate in very similar environments. Special forces always train like they fight. Period. With at least 45% of Americans concerned that open domestic military exercises are a precursor to greater federal control over states and more than 62% convinced that government power is suffocating individual liberty, it is only a matter of time before the government spin doctors create a semi-believable rationale for such endeavors as Jade Helm. I believe that ISIS could be their perfect rationale. As public concern is amplified and evidence indicating that the Department of Defense is lying about the purpose of JH15 is more widely recognized, the DOD may very well admit that the operation is not for training in foreign theaters. Rather, they may argue that JH15 is in fact training designed to protect Americans on American soil from widespread terrorist threats. That is to say, the new spin will be that Jade Helm is meant to save us all from the psychopathic child killing cannibal monstrosity known as ISIS. Maybe I am connecting dots that are not dots, but it seems to me that the timing of ISIS warnings, the re-ignition of economic downturn in 2014/2015, the global shift away from the dollar, and Jade Helm are not entirely coincidental. Martial Law is not a scenario that can be generated in a vacuum; it needs a primer, a trigger event, if not multiple trigger events. If the final trigger event is indeed intended to be a terror campaign on U.S. soil, then questions of the true purpose of Jade Helm will undoubtedly take a back seat to immediate solutions to what amounts to a foreign invasion (at least, that is how it will be painted), and none other than Jade Helm will be presented as that solution. The debate over JH15 and programs like it will change. It will become a matter of the “greater good” against a foreign enemy, rather than a government overstep against the rights of the people. How can we possibly question the defense of American soil against terrorists? Isn’t that an undeniable directive of the military? And if we do question such a directive and its value to the American people, are we not “weakening” the resolve and effectiveness of the defense apparatus through negative public opinion? And by extension, would that not make us “domestic enemies” as well? In fact, I can easily argue that there is absolutely NO rationale for domestic military operations against ISIS or anyone else, and here’s why. As I outlined in detail in my article “The Time Is Ripe For A False Flag Attack On American Soil,” the organization known as ISIS has long been a collaborative creation of the U.S. government and its allies. From funding and training in Libya and Jordan, to arming in Syria and Iraq, ISIS is nothing without the Western intelligence apparatus, just as al-Qaida was nothing more than a CIA Frankenstein monster. So should Americans be forced to relinquish their freedoms in order to combat an enemy that our own government engineered out of thin air? And beyond that, who represents the greater enemy: ISIS or the lunatic elitists who gave ISIS the tools to commit atrocities? Some people may argue that the true origins of ISIS are a matter of historical debate that will not solve our immediate problem of rampant terror threats. How can we nitpick where ISIS came from while ISIS is trying to massacre us? Fair enough. 1) It is too inept to prevent such events from occurring due to its refusal to secure our borders and despite full-spectrum surveillance of the American people by the NSA. 2) It is so evil in its machinations that it has allowed terrorist infiltration in order to further an agenda of greater control. Either the government is a bungling bureaucratic mess not capable of keeping anyone safe, or it is a cesspool of tyranny that has no intention of keeping anyone safe. In either case, why should the American people give such an entity even MORE power, when it can’t responsibly handle the considerable power it already has? Official martial law may never be declared, but it could nevertheless become a reality. 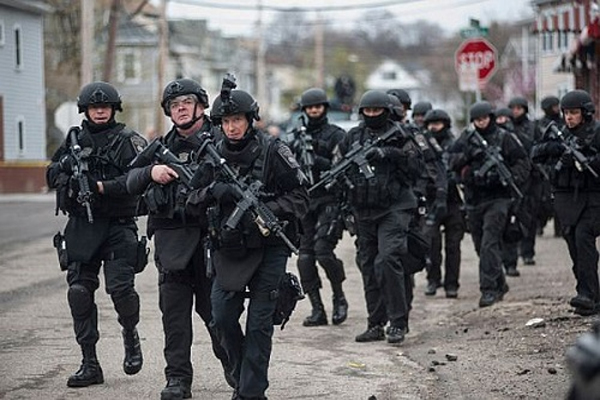 I would present the response to the Boston bombing event as a direct example of militarization of a domestic region without it being called “martial law.” This was, of course, a “federalized” response, rather than a military one. But it was militarization in its nature all the same. The establishment will use all kinds of mislabeling and spin in order to entice the populace to submit to further encroachment of liberties in the name of security. The fact is the best defense for the civilian population of America has always been the individual population itself. Terrorists are far more likely to be thwarted tactically and psychologically by a trained, armed, aware and free citizenry than any oppressive federal or military dragnet. Why? Because the citizenry is the target, and thus, always first on the scene to respond. Citizens become victims when they wait around passively for government “authorized” responders to save them, instead of adopting the attitude that THEY are responsible for their own defense. Legally, it is a constitutional mandate that American militias retain authority over domestic defense. And to be clear, the militia is every able-bodied American, not only a certain percentage of Americans the government deems acceptable (which means the National Guard does not qualify as the militia). This is the answer to the propaganda of militarization. We do not have to choose between liberty and security. We can have both, and we can provide it for ourselves as our own protectors. Sheepdogs be damned. Each citizen is his first and best line of defense. Only when the American people take on the philosophy of self-defense rather than government reliance will we be free of fear from terrorism and free of fear from tyrannical government. It starts with each of you, in your homes, neighborhoods, towns and counties. Citizen organizations for mutual aid and security to counter any threat, regardless of the mask it wears, will be the catalyst for a legitimately free society. In the face of such organization, martial law is not only illegitimate, but entirely unnecessary. ISIS does not matter. It is what we ultimately do about ISIS or similar threats that matters, and martial law is not the answer. If such an attack were to occur, Martial Law would not be justified. What would be justified however, is the impeaching of President, Barack Obama. It was his inaction on the border issues that allowed the terrorists into the United States. The blame needs to be put where it belongs.